Join the Bread whitelist now. These days, crypto is experiencing a massive influx of people who are completely new to cryptocurrencies. Sites like Coinbase are experiencing an unprecedented amount of signups. But what do these users do when they want to go beyond bitcoin, ether, and litecoin? Or even when they just want to extract their funds from a centralized exchange? Solutions like Metamask and MyEtherWallet work well for somewhat tech-savvy users, but our new fellow crypto enthusiasts expect something simpler. Bread is a solution to the UI problem that Buterin addresses – it’s a crypto wallet which is designed to be simple to use. At the same time, Bread aims to have the highest level of security needed for holding cryptoassets. Bread’s core team consists of Adam Traidman (CEO), Aaron Voisine (President), Aaron Lasher (CMO), James MacWhyte (CPO), Samuel Sutch (CTO), Brent Traidman (CRO). The team has a wide range of experience from founding startups, and they have multiple successful exits to show for. In addition, they have strong crypto experience in the team, with CPO James MacWhyte having worked at crypto exchanges Kraken and Coinbase. The advisor team has some very high-profile names. Specifically, Bread’s advisors are Litecoin founder Charlie Lee, Bitgo co-founder Ben Davenport, Dapps Fund founder David Johnston, East Ventures founder Batara Eto, as well as Shinji Kimura and Mai Fujimoto, who are both well-known figures in Japan’s crypto scene. What utility does the BRD token have? Finally, BRD holders will get exclusive access to premium features of the Bread app. How can I buy the BRD token? The Bread ICO starts Friday, December 15th. You can join their whitelist here. Note that there has already been a pre-sale where the maximum bonus given was 20%. Bread will offer 106M tokens in the token sales, and they’ve fixed the total supply of BRD at 160M. At the time of writing, Bread is among the fastest growing Telegram groups – narrowly beaten by CoinFi, whose pre-sale starts this Friday. 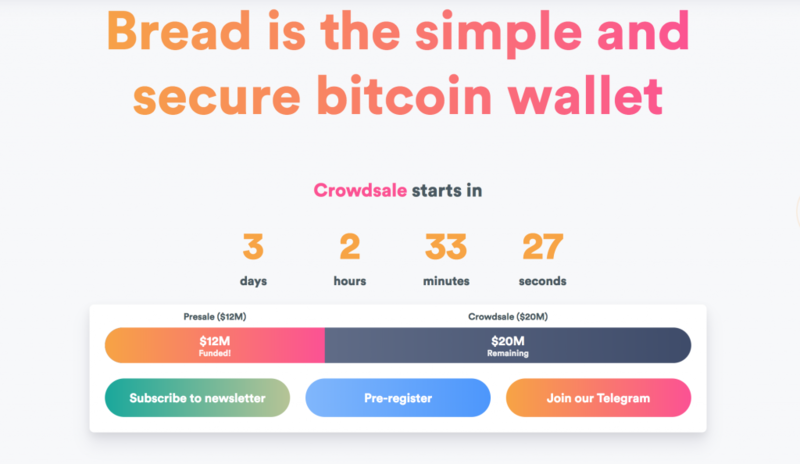 Bread has a strong team with a great track record, they’re tackling a problem with a large addressable market, but they’ll also face competition from other wallet providers. Based on this, we rate Bread as a Solid ICO.